"Perfect, right out of the box"
"We have bought several high-end traders workstations from Digital Tigers (Stratosphere series) and we have been thoroughly pleased with them. For many years I have been building custom machines for myself and clients because I have not been happy with "commodity" machines. I was a trader myself for about 15 years so I know exactly what best suits that kind of demanding user. Digital Tiger's workstations are built from quality components and the stylish cases have plenty of room for additions and upgrades. The video subsystems have pleased out traders and everything worked perfectly right out of the box. I especially appreciated the lack of "advertisement" software. I just hate spending time uninstalling "garbage" from the usual desktop systems. Best of all is the personalized attention [you will receive] from Keith and his associates. They are friendly but thoroughly professional. I have also never had to wait around for an automated email response or had to look up my support "ticket". I just pick up the phone and someone there is always available to help me. In short, I highly recommend using Digital Tigers for the specialized needs of a trading "war room". But you also consider using them for your developers, network engineers, etc. Frankly I will buy them for my home use as my network of a dozen "custom" development machines begins to show signs of aging." "This is to report my CONSUMMATE SATISFACTION with not only your product, which I have used for two years, but with a just-completed contact with one Kevin of your tech support staff. Kevin did ONE HELLOFAJOB for me and I really appreciate it. He was patient, thorough, and above all CAREFUL in guiding me through a small fix that turned out to involve a lot of steps. In my view Kevin is a PRINCE AMONG MEN!! I would urge you to promote him but we NEED him doing what he does so well, so just double his salary." "As always, but no less sincerely, thank you for the exceptional service that you and everyone at Digital Tigers have unequivocally provided to me." "My experience with Digital Tigers has been flawless. I would recommend them to anyone in my business." I felt compelled to put this in writing so that it might speak to my experience with Digital Tigers for the last 4-5 years. I will pay you the compliment of getting right to the point. I am an old Green Beret & abhor small talk. A few statements (which I would be willing to speak about if someone wanted to call me regarding references before purchasing your products). I have purchased 2 computers & your Sidecar over the last 4-5 years. I am a full time trader & earn a high 5 figure monthly income. It costs me significant $$$ when my computers break down. With the inevitable "tweaks" that occur with sophisticated software it can become bothersome if not handled correctly. The level of service provided by John B. (specifically) & his staff of technicians has been beyond reproach. Every issue I have had has been handled effectively, efficiently and professionally. "I have installed the new dvd rom drive and it works with the kind assistance from Kevin. He is a great technician who is skilled and very patient as he assisted with my software and hardware issues. He is a great asset to the company support team." 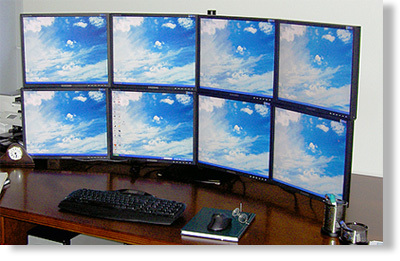 Stratosphere workstation & Trio 20"